Like the Tuxedo, some things never go out of style. 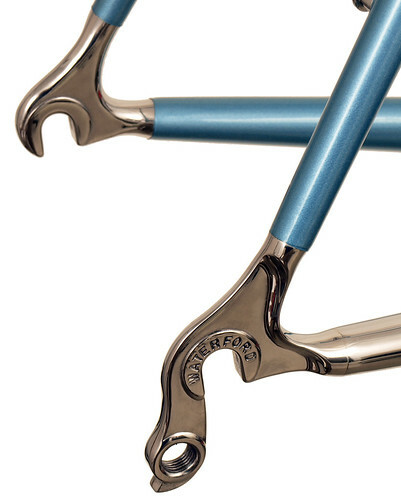 The Newvex lugset by Richard Sachs, pays tribute to the classic Nervex Professional lugs that dominated the high-end bike scene from the mid-50’s to the late 70’s. 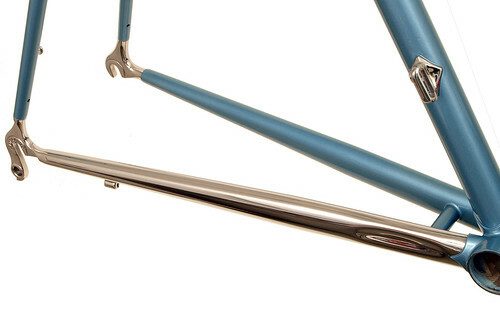 Available in stainless as well as chromoly, you can have the look of the classic Schwinn Paramounts with a fit for you and the technology of today. This is also an option for full stainless frames. 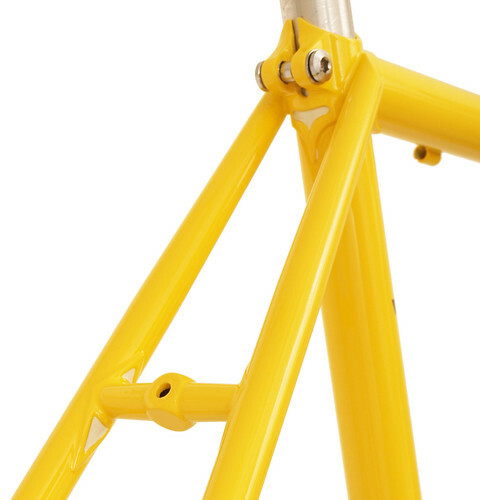 The base design includes a 15mm head tube extension for easier fit. It is available for 1″ steerers only. 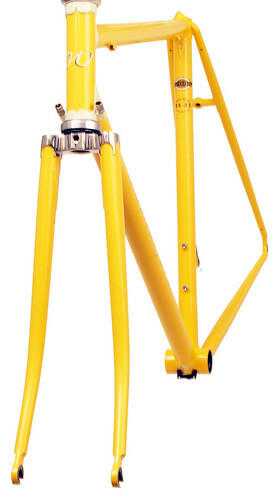 Lug angles are limited, so not all geometries can be fabricated. 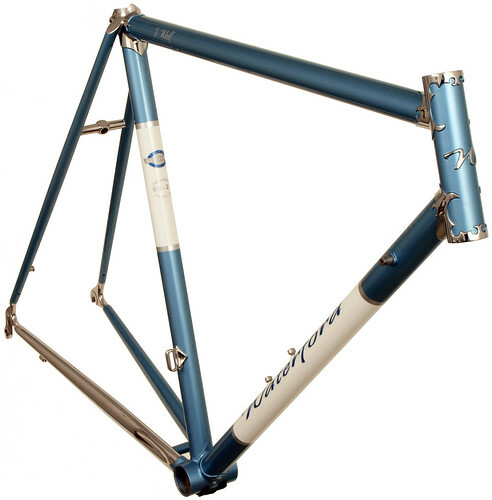 Richard Sachs (among other suppliers), offers a number of well-done lug styles, including the Richie-Issimo lugset shown among the photos below. You, Waterford and your local shop can explore the possibilities. Newvex Lugs on Waterford 22-Series Artisan. 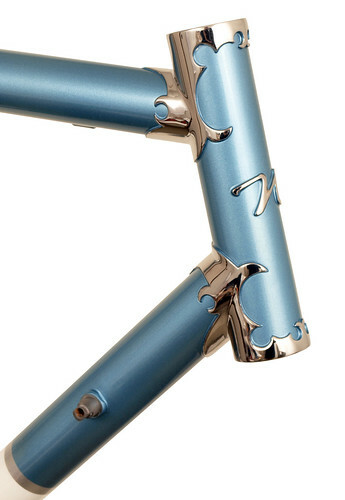 Head tube shot of 22-Series Artisan frame with stainless steel, full polish Newvex head lugs and English Blue (metallic) finish with white panels and silver strips. 1" steerer only. 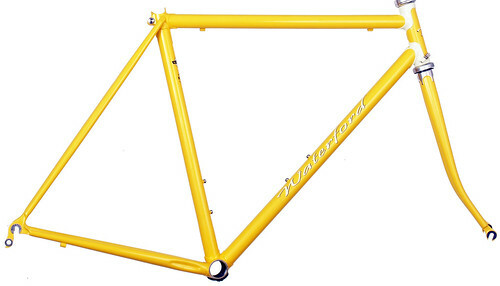 Waterford 22-Series with stainless chainstays, dropout and front derailleur boss. 64237. 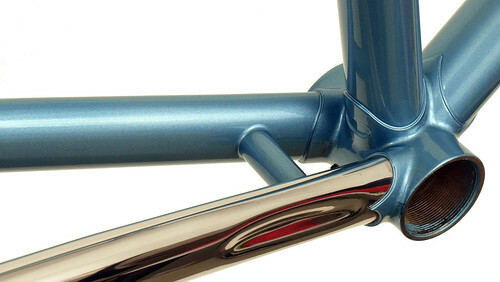 Waterford stainless steel rear dropouts and stainless chainstay with English Blue paint. 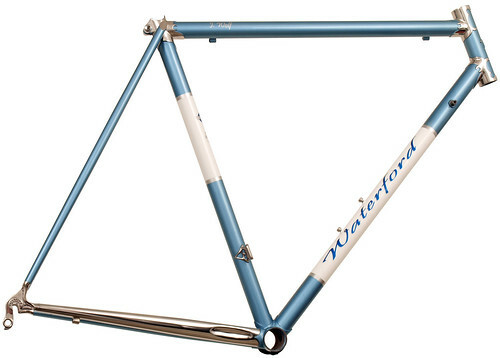 Waterford 22-Series Road Sport featuring Sachs' Richissimo Lugs in Canary with painted lugs. 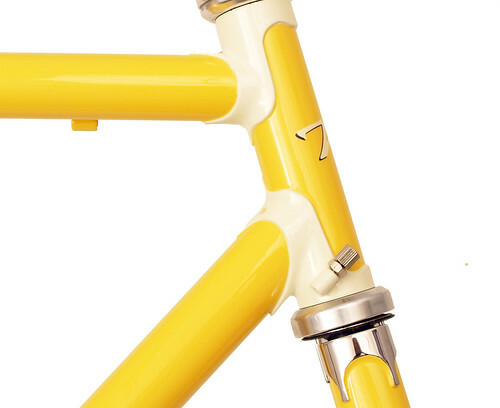 These lugs included built-in cable guides. Front view of Waterford 22-Series Road Sport featuring Sachs' Richissimo Lugs in Canary with painted lugs. 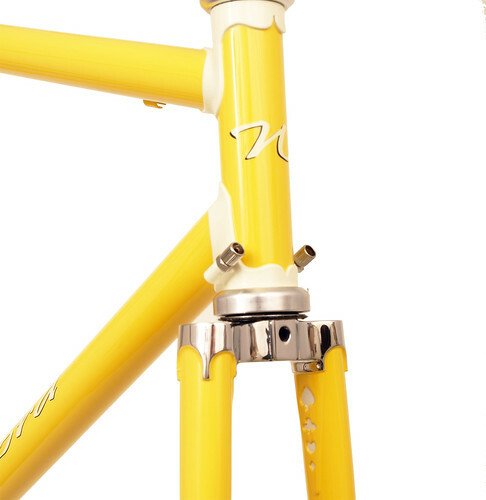 These lugs included built-in cable guides. 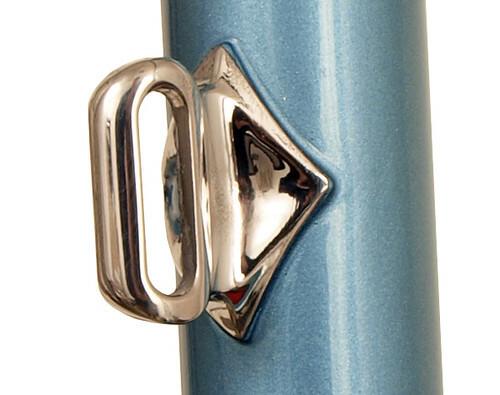 Head tube detail on Waterford 22-Series Road Sport featuring Sachs' Richissimo Lugs in Canary with painted lugs. 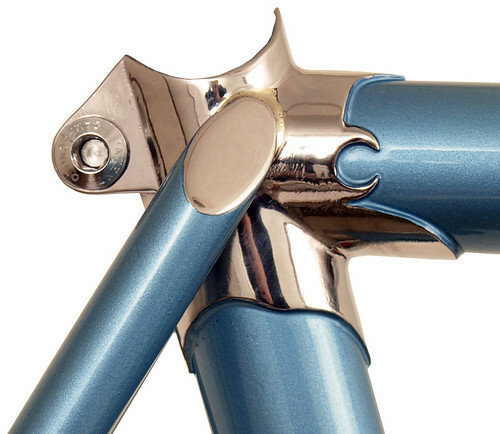 These lugs included built-in cable guides. Seat cluster detail on Waterford 22-Series Road Sport featuring Sachs' Richissimo Lugs in Canary with painted lugs. 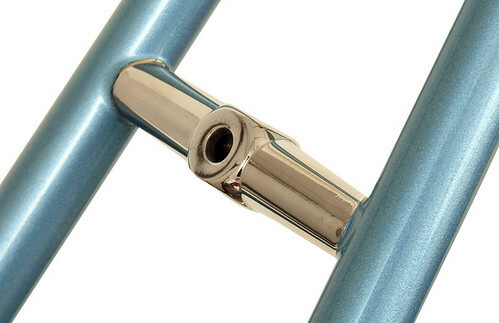 These lugs included built-in cable guides.